On October 16, 2018, Dr. Hong, Tao-Tze, President of the Federation of World Peace and Love (FOWPAL), led the FOWPAL delegation to visit H.E. 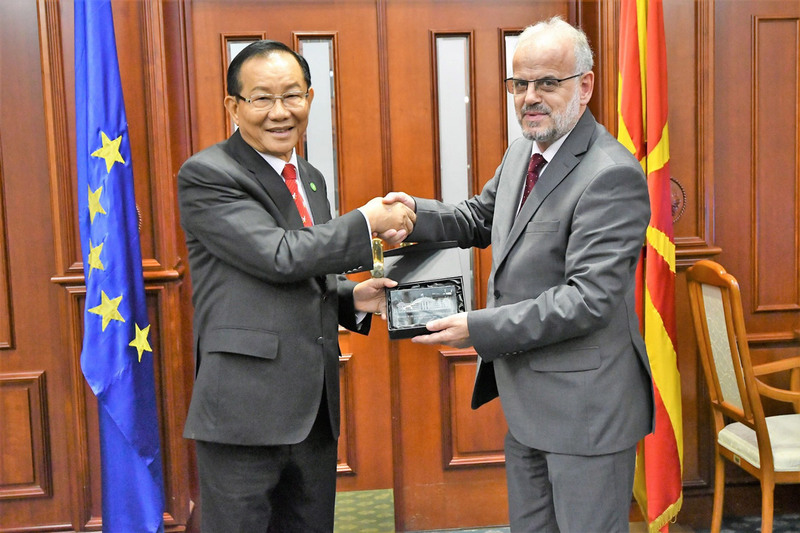 Mr. Talat Xhaferi, Speaker of the Parliament of Macedonia. 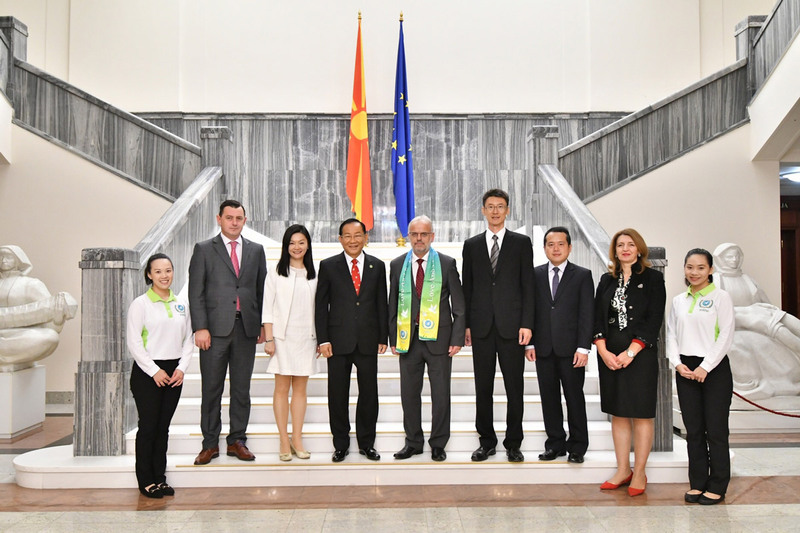 The dialogue between Dr. Hong and Speaker Xhaferi was full of loving, peaceful energy. Speaker Xhaferi shared that the Parliament of Macedonia is currently debating constitutional amendments to resolve the dispute with neighboring Greece and stabilize the region and Europe. Dr. Hong pointed out that cultural exchanges between nations are very important because such exchanges will make the nations stronger and more prosperous. Macedonia, situated in the heart of the Balkans, gained its independence in 1991 following the breakup of Yugoslavia, which was a communist country. Many wars were fought in the region, and it was once under the rule of the Byzantine Empire, the Ottoman Empire, etc. For the past 27 years, Macedonia has had an ongoing dispute with Greece over Macedonia’s name. Greece opposes the use of the name, arguing that it causes confusion as the names of the Republic of Macedonia, the adjacent Greek region of Macedonia, and the ancient Greek kingdom of Macedonia are similar. King of Macedonia, Alexander the Great ruled an expansive empire, and modern Greeks feel proud of this part of their history. The name dispute has been a stumbling block for Macedonia to join the European Union and NATO. On September 30, 2018, Macedonia held a national referendum on renaming the country. Over 90% of the voters supported a name change, but the referendum was ruled invalid because the turnout was only 37%, lower than the required 50%. The Parliament is discussing a solution to the name row with Greece. Speaker Xhaferi mentioned that the Parliament was debating constitutional amendments that are part of an agreement with Greece to rename the country, in exchange for NATO and EU memberships. 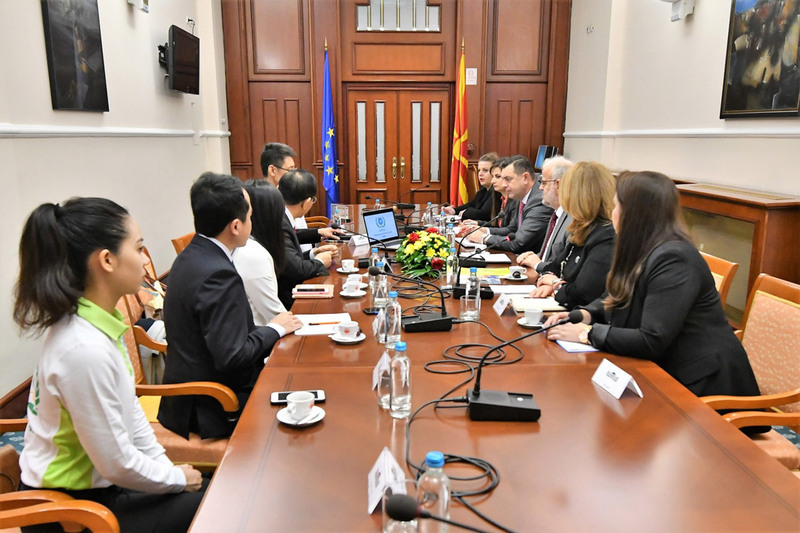 Currently, Macedonia has received an invitation to join NATO, and Speaker Xhaferi hopes to start negotiations in 2019 regarding Macedonia’s accession to the EU. The Balkans have experienced many wars and conflicts in the past; to prevent history from repeating itself, it is important for Macedonia to join the EU as it will enhance the region’s security, stressed the speaker. Dr. Hong shared FOWPAL’s experiences of promoting love and peace across the planet. FOWPAL has forged friendships with many countries through cultural exchanges, and Macedonia is the 86th nation that it visited. Dr. Hong also pointed out that it is important for everyone to wear a smile because smiles bring happy energy. He also remarked that smiles and happiness make the completion of any endeavor easier and make the world more peaceful. Since birth, we have faced one difficulty after another; only with a cheerful heart, can we enjoy a more relaxing life, added Dr. Hong. Over the past 52 years, Dr. Hong has been promoting culture, love, and peace. He emphasized that currently every country is undergoing a great transformation, and he believed that after the conversation with Speaker Xhaferi, the speaker and Macedonia will become better and better. 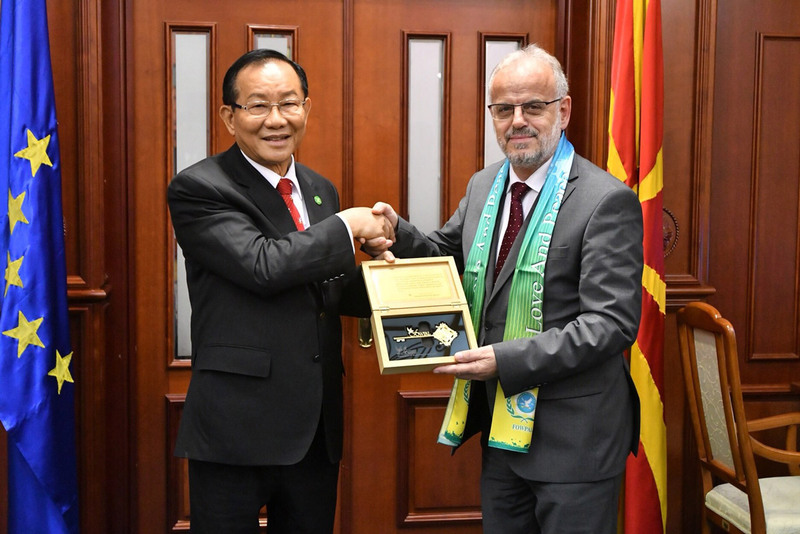 Dr. Hong presented the “Key to the Heart” to Speaker Xhaferi and praised him as the “key man.” Dr. Hong invited the speaker to visit FOWPAL in Los Angeles and to work together for world peace. On this trip, the FOWPAL delegates also visited many places in Macedonia. They visited historic sites and experienced the integration of various races, cultures, and religions. Mother Teresa, the 1979 Nobel Peace Prize laureate, was born in Macedonia; her statues and pictures are ubiquitous. In front of her statue, the FOWPAL delegates sang a song called “Love and Peace Song.” Through music, dancing, and sharing, the FOWPAL delegates spread the seeds of love and peace wherever they go.